In a PDF document, there may be a variety of elements such as text, image, link, draw, etc. When you finish creating a PDF document, you may find that there are some mistakes in the document. So you need to edit the PDF document again. If there is something wrong with the rectangle in PDF document, you will need to edit rectangle. The application recommended in this article is PDF Editor which is the product of VeryPDF. It can edit the contents, comments for PDF document, also can convert and read PDF document. To use it, you need to download it at www.verypdf.com/pdf-editor/pdfeditor_setup.exe and please install it on your computer. The link above is just for downloading the free evaluation version of PDF Editor. If you want to use PDF Editor without any limitations, please buy it by entering its homepage at http://www.verypdf.com/app/pdf-editor/index.html. After installing PDF Editor on your computer, you can use it at once. Please open the application by double clicking the application icon if you can find it. Or you can right click the icon and choose “Open” option to open the application. If you cannot find the application icon, please click “Start”—“All Programs”—“VeryPDF PDF Editor v2.6”—“VeryPDF PDF Editor”. Then please input the PDF document into PDF Editor. For adding the document, you need to open the dialog box named as “Open” because in it you can find the PDF document from the locations of your computer and add it into the application. So for opening this dialog box, please click “File”—“Open” or click “Open” button in the toolbar. You can also use the hot key “Ctrl”+ “O” combination to open this dialog box. Now you can edit rectangle for the inputted PDF document. 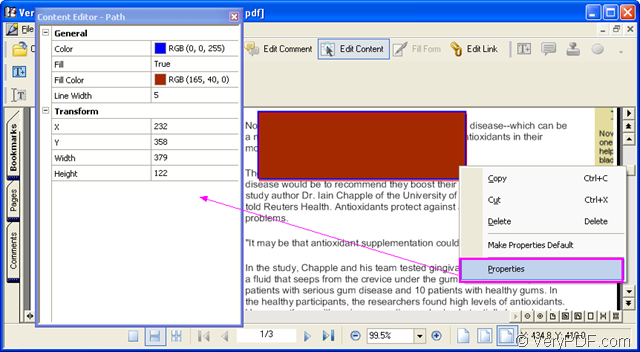 Please see the interface of PDF Editor in figure 1. You need to open the content status by clicking “Edit Content” or “Tools”—“Edit Content”. Then click the rectangle in the document until you can see a red frame around the rectangle, when you can edit the rectangle. When you right click the rectangle, you can select to “Copy”, “Cut”, “Delete” the rectangle in the floating item. If you choose the the “Properties” option, you will see the dialog box box “Content Editor-Path” dialog box. In “General” form, you can set the line color, width for the bolder of rectangle or the fill color of it. In “Transform” form, you can also change the coordinate of the the start point or the rectangle by customizing the values of “X” and “Y”. Then please save the changes you have made by clicking “Save” button in the toolbar or click “File”—“Save”. You also need to create a new PDF document via clicking “File”—“Save as” to open “Save as” dialog box which enables you to choose the output path and input the name for the new PDF document. Then the new PDF document will be generated in the specified location. You can browse it with PDF Editor again. How to edit rectangle comment in docPrint preview application? This entry was posted in PDF Editor and tagged edit rectangle. Bookmark the permalink. You can contact us by following ways:http://www.verypdf.com/support/index.htm Once we receive your letter, we will reply you at once.